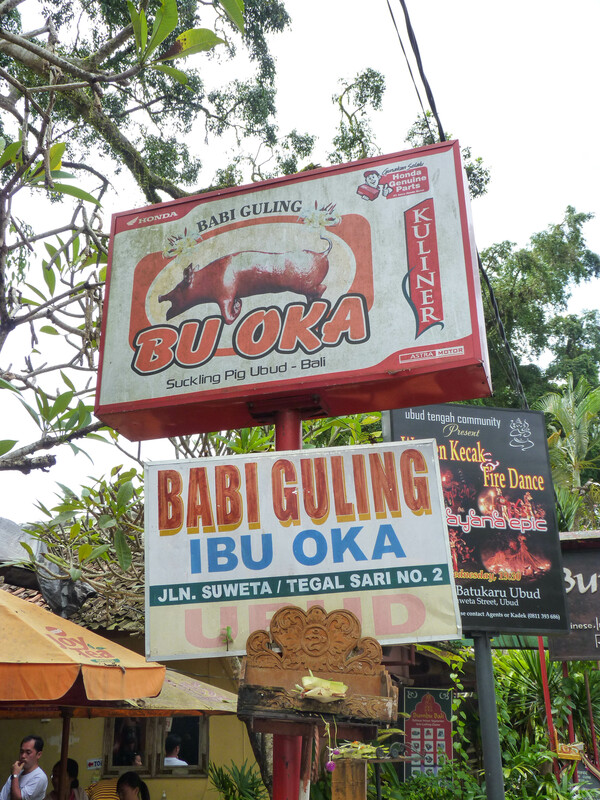 Ibu Oka is set in a small, open-air space opposite the Ubud Royal Palace and is most famous for Anthony Bourdain’s loving coverage and praise of the restaurant and its product, Balinese style babi guling (roast pig) . On the southern end of the space stands the kitchen area, while the rest of the space is reserved for diners: a raised platform with low tables allows diners to enjoy their meal sitting on the floor, while the lower part features round tables with plastic chairs and umbrellas. 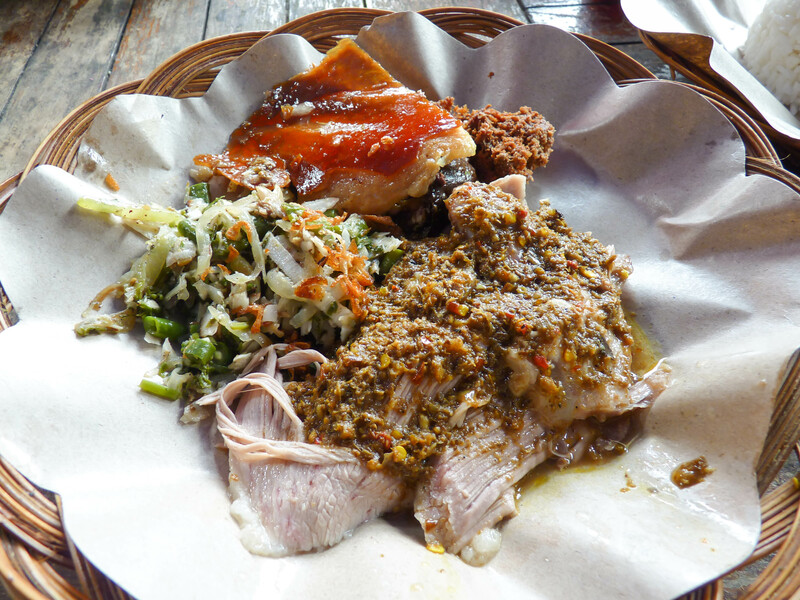 It’s not a pretty sight, if you’re used to neat servings of Western food, but it’s Balinese soul food exemplified: a substantial rice and meat meal highlighted by the crisp, savory skin and the fatty pork meat. To make babi guling, whole pig carcasses are stuffed with various herbs and spices including galangal, ginger, lemongrass, kaffir lime, shallot, salam leaves, fresh tumeric, coriander seed, and Thai bird chiles. After stuffing, the carcass is roasted on a giant spit, turning slowly over a fire for several hours until the skin turns a rich, deep brown. 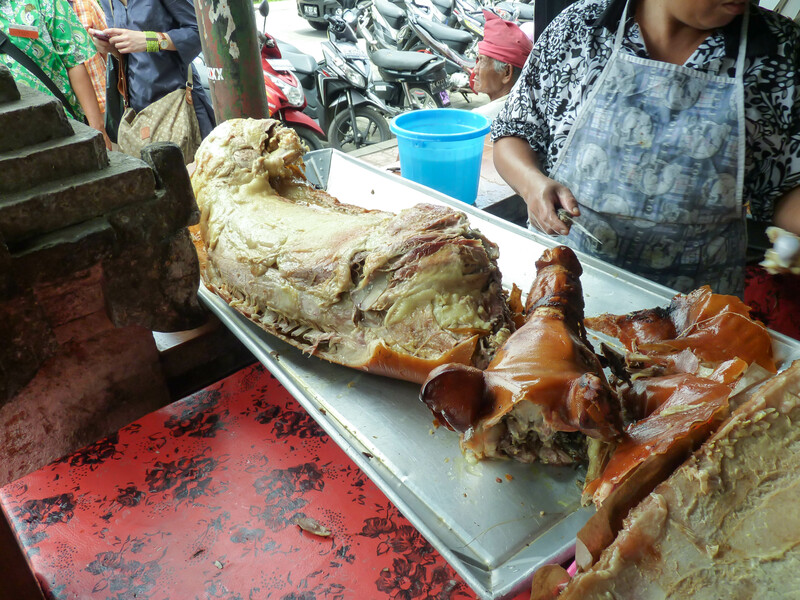 The complete meal below was absolutely delicious and offered the best parts of the pig including pieces of belly and shoulder meat, a square of crisp skin, a piece of blood sausage, steaming rice, and a helping of spicy, pickled vegetables to balance the plate. The restaurant is only open for a few hours a day when the first of six whole pigs makes its way to the premises atop a speeding motorcycle. 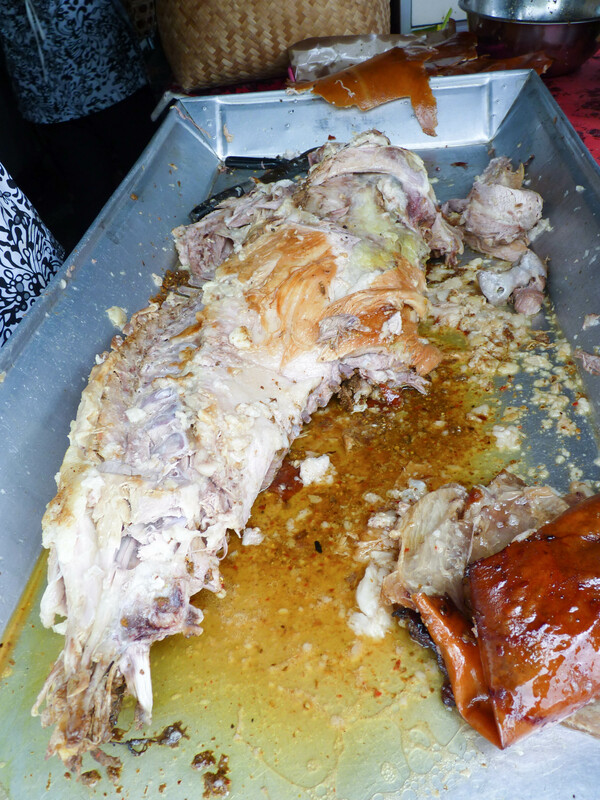 Ibu Oka stays open until the last pig is chopped up and served to their hungry guests.